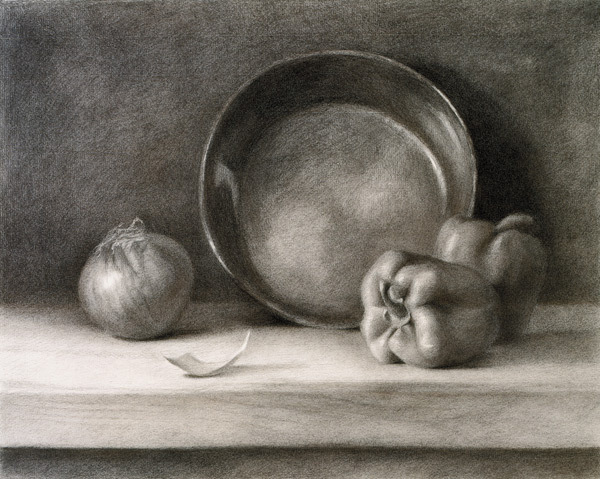 Now that you have all the basics of drawing down, draw your own still life that you can paint later on if you continue with the Beginner’s School painting courses. This is not a practice exercise like all the others. Create something that you are proud of! You’re probably wondering at this point why I’m having you make so many still life drawings. 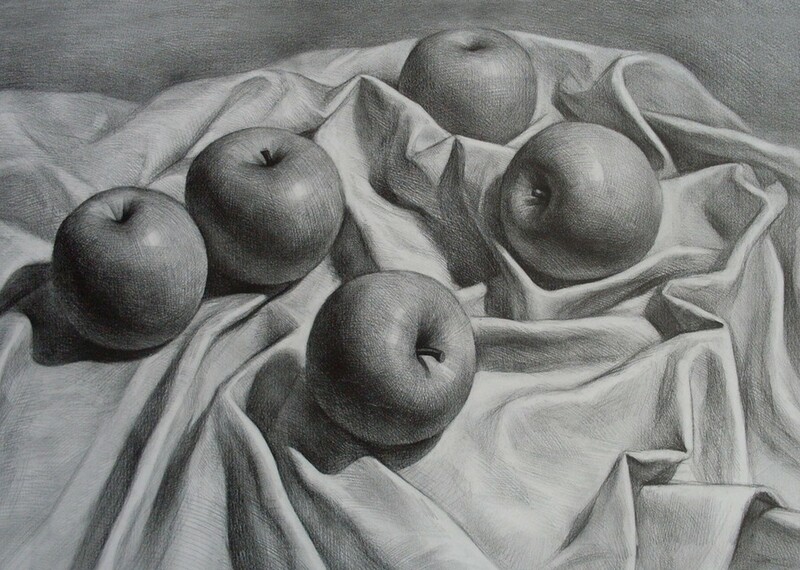 Maybe you’re interested in drawing people or landscapes—not fruit and bottles. Or maybe you have a photograph you really want to be able to draw, but I haven’t yet said “get a photograph and draw from that”. The reason for that is that photographs are already two-dimensional—flat—images, just like a drawing. It’s a one-to-one translation. Taking something that’s three-dimensional and converting it (by drawing) to a two-dimensional picture really forces you to look and understand the thing that you’re drawing. Drawing from life helps train your eyes to really see and makes you a better observer. I’m not saying that you always have to work from life, but you really should as often as possible. It’s challenging, it’s fun, and you’ll be really rewarded with some great skills if you keep on practicing. 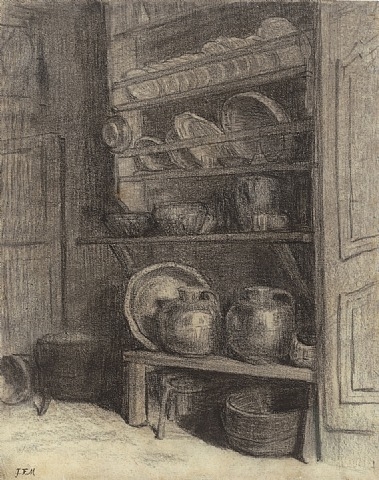 As for drawing people and landscapes, remember the Forms Into Objects lesson? 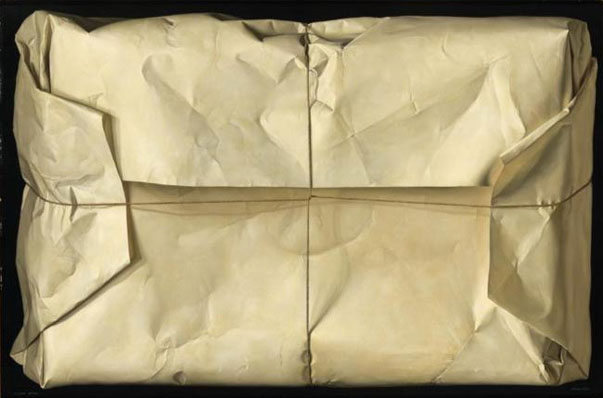 Once you can draw a cube, then a tissue box sitting in front of you, you’re already close to being able to draw a body or a building in realistic space. The pelvis and rib cage can be easily turned into boxes as you’re drawing a figure; trees are just cones and buildings are more boxes. We work hard on the boring stuff so that we have a good foundation when we get to move on to the really fun stuff and you’ll be surprised at how much better your drawings turn out once you have that solid foundation. 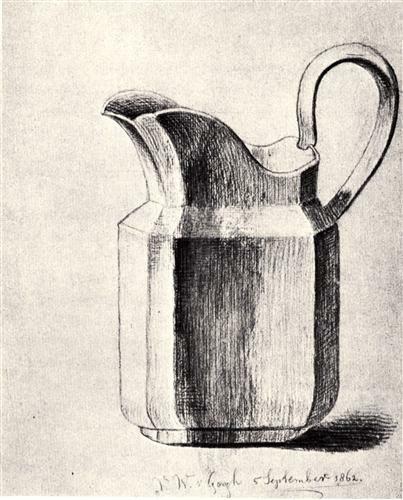 There are many different kinds of still life drawings you can do. Let’s explore some of them in—a Brief History Lesson (my favorite, as you know)! 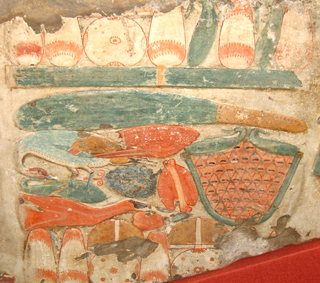 In ancient Egypt, still life paintings adorned the interior of tombs, depicting food and other objects that were thought to become real in the afterlife for the benefit of the deceased. 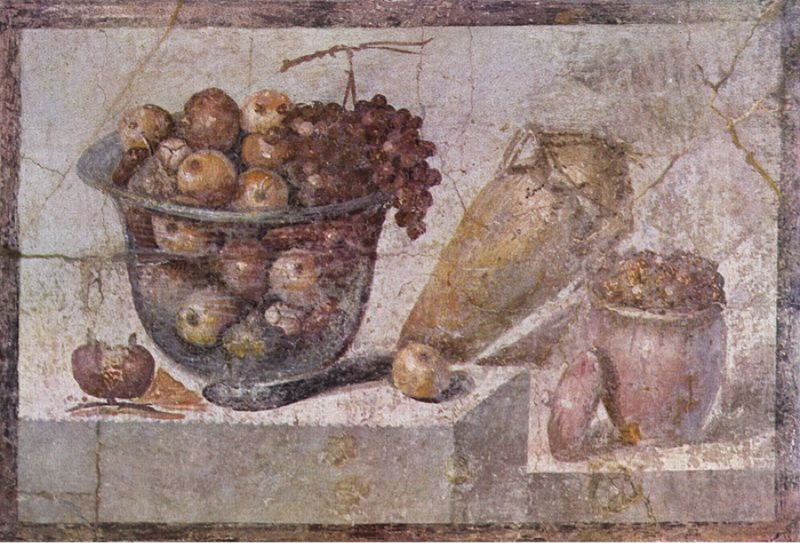 It may be hard to tell, but this still life contains a duck, a basket of figs, grapes, bread, and more meat. 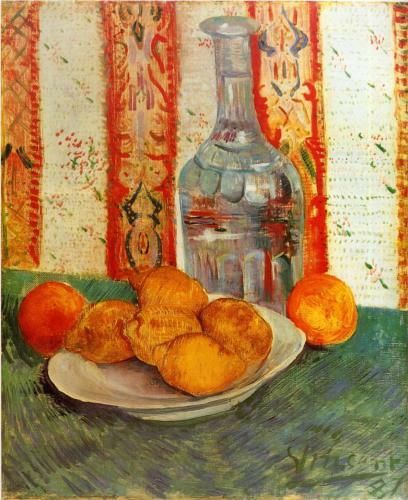 The Greeks and Romans also made still life paintings, although not quite as stylized as the Egyptians. They were also fond of making still life mosaics inside their buildings. 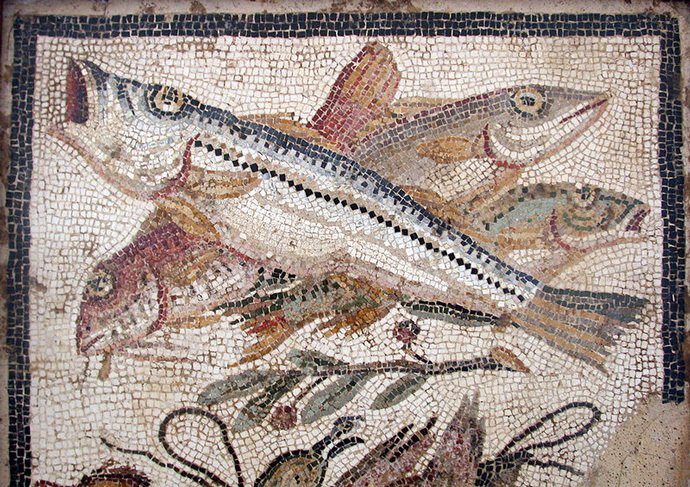 Still life mosaic from the House of the Cascades, Utica, Northern Africa. 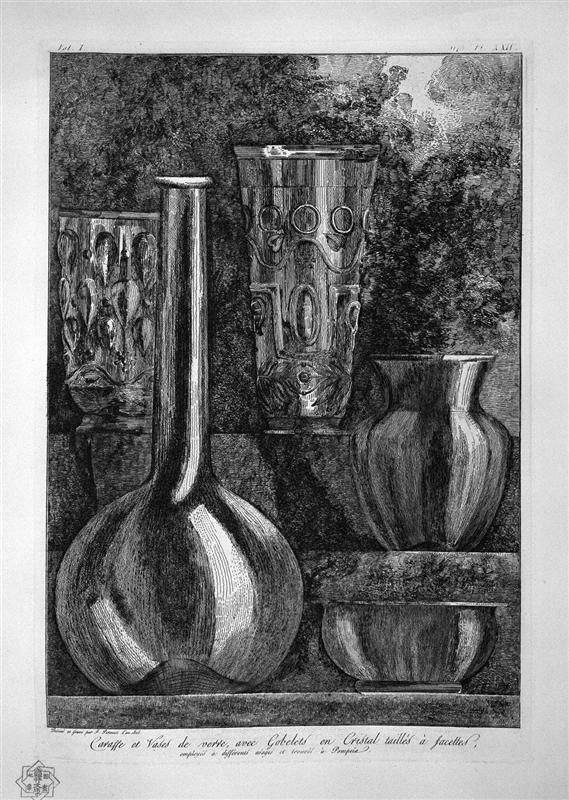 In the Middle Ages, the still life became imbued with all sorts of religious symbolism. 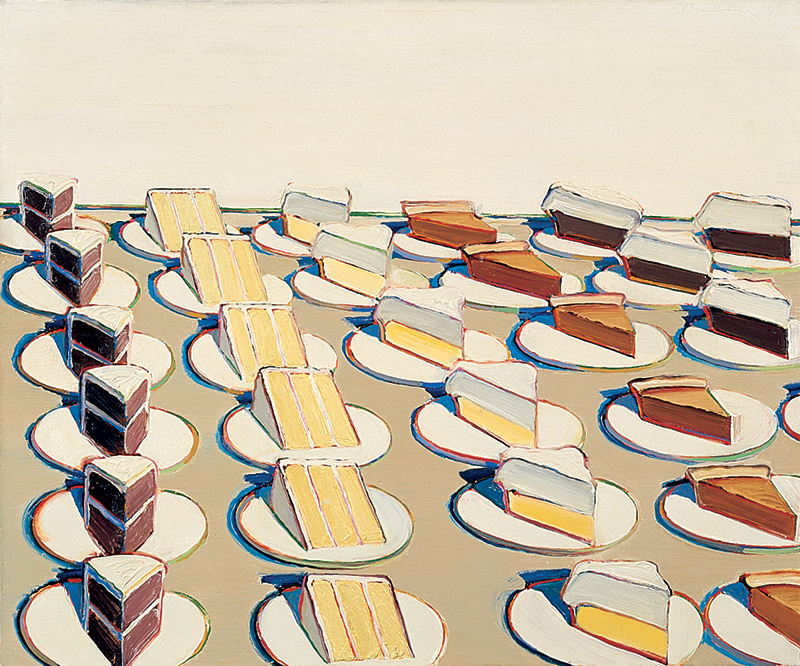 At a time when many people were illiterate, the works served as visual messages to the people. Allegorical paintings helped to spread the message of Christianity throughout Europe when very few people could actually read the Bible. 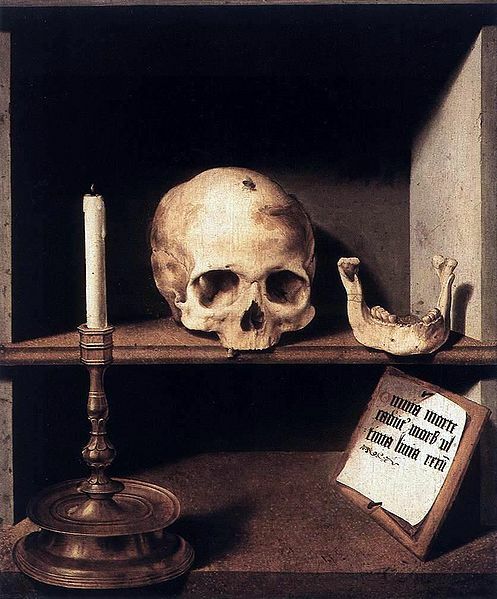 The placard reads in Latin: Omnia morte cadunt, mors ultima linia rerum. English translation: Everything passes with death; death is the ultimate limit of all things. This may seem a bit grim, but it was reminding people that, like taxes, death is certain. And when it comes, you will be judged by God, so you’d better act accordingly. Go to church, eat your vegetables, don’t be mean to your parents. 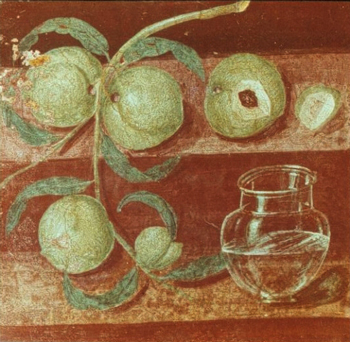 The first to break from the tradition of religious overtones in a still life was Leonardo da Vinci, who did small watercolors of fruit purely in the interest of learning more about nature. 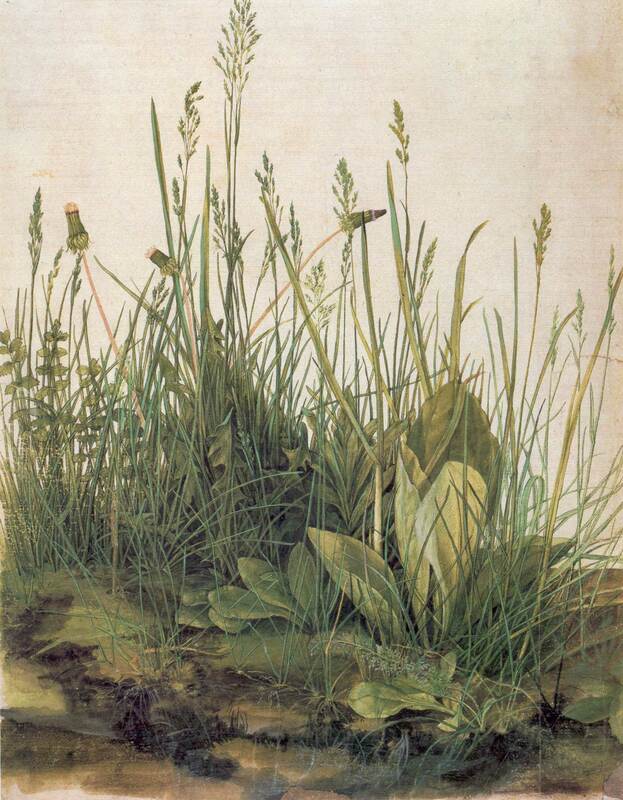 Albrecht Dürer made such precise drawings of plants that they are identifiable today. The 16th century offered a lot to the still life tradition—people were exploring more of the world and discovering new lands. 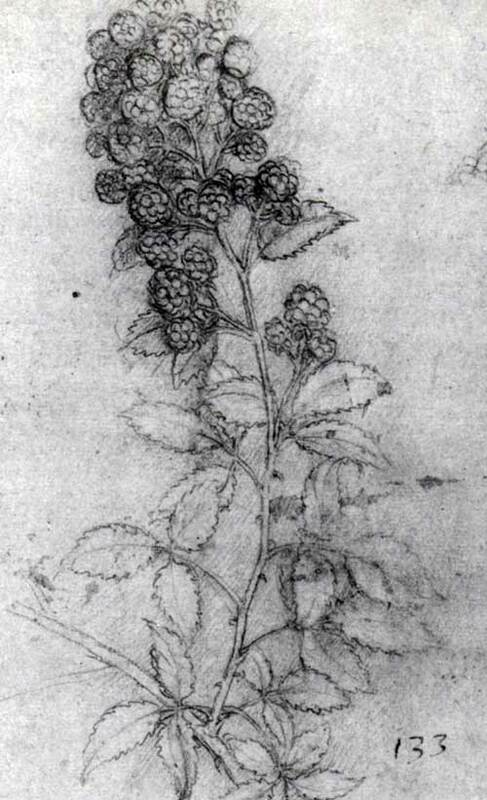 To record their new discoveries, drawings were made and artists started to record the findings in botanical encyclopedias. 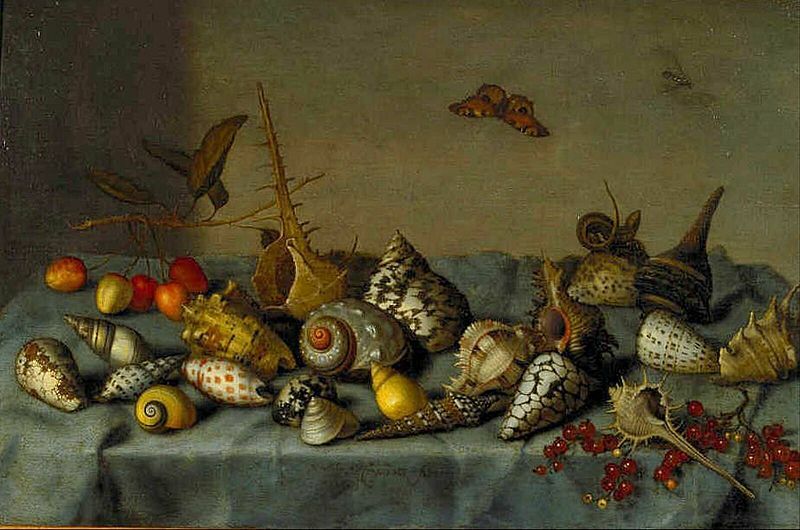 Shells, insects, exotic fruits, and flowers began to be collected and traded and new plants like the tulip (which was exported to Europe from Turkey) became prominent in still life paintings even throughout the 17th century. 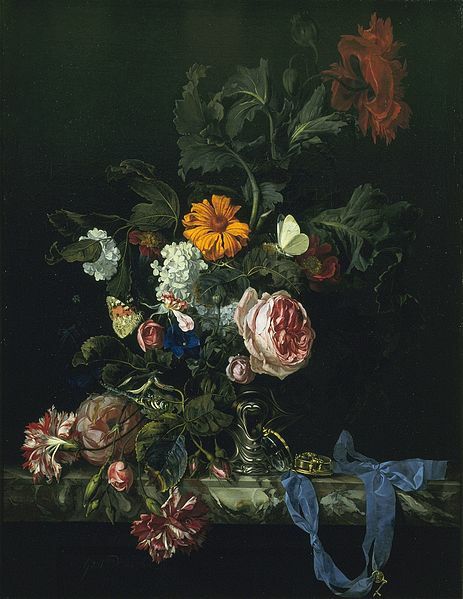 The symbolism of flowers was resurrected in the Victorian era and was actually utilized much more during that art historical period. As for insects, the butterfly represents transformation and resurrection while the dragonfly symbolizes transience and the ant hard work and attention to the harvest. We may at first read the above painting as just a still life—after all, its title is Still Life of Flowers, Shells, and Insects. 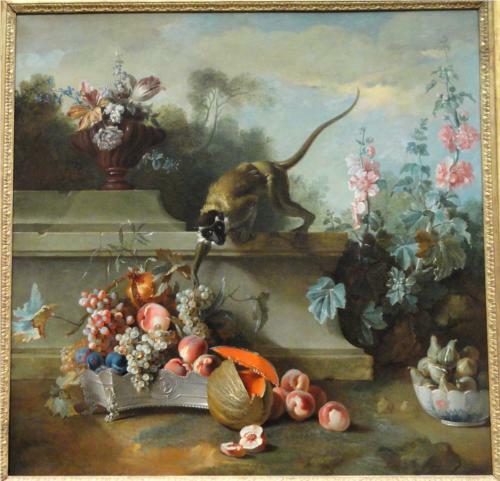 Dutch still life paintings were loaded with this “you-can’t-take-it-with-you” message, placing heavy emphasis on morality over material gain. Focusing on your soul and being a good person will benefit you when you “meet your maker,” but your accumulation of wealth will not. If we look closely at the painting, we can see some hidden, coded messages. 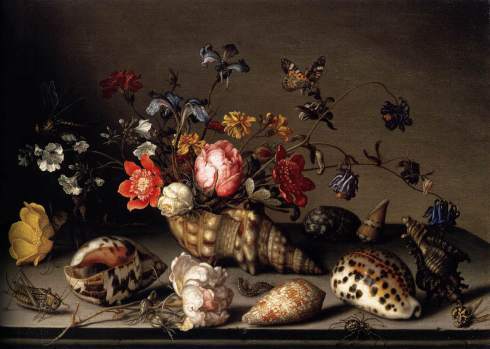 It looks like a lovely array of flowers and shells but thinking about them critically, the shells once carried living animals that are now dead and the shells are empty vessels. The flowers will only last perhaps a few days after the painting is completed (or perhaps they didn’t survive the entire painting process at all). 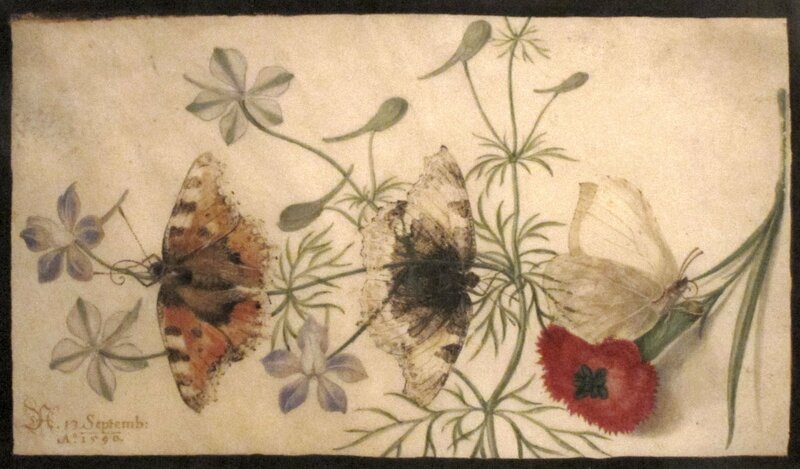 A caterpillar looks up towards where a butterfly is sitting, suggesting the power of transformation (knowing the time period and location this painting is from suggests it is a spiritual transformation). The butterfly is never out of danger though as a predator, the dragonfly, lurks in the dark to the left of the canvas. 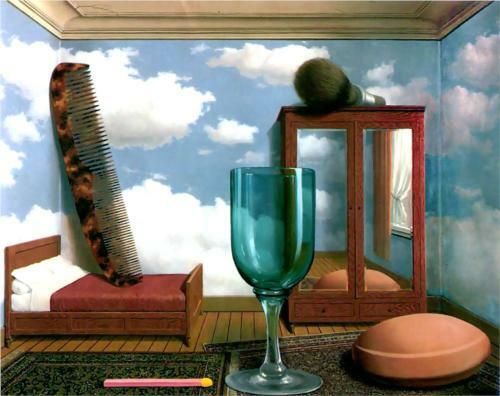 The diagonal line of the composition (from top left corner down to bottom right corner) leads our eye to a dead hornet, curled in a fetal position in the bottom right corner of the painting. A possible interpretation of the hornet could be that as a pollinator, the hornet represents new life. 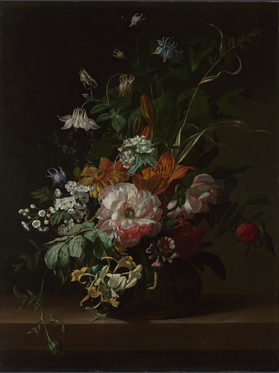 Being dead (not pollinating) is another symbol for death, which could, in turn, have several connotations, the most likely for this genre of painting is as a memento mori or allegory of vanitas—a reminder that life is short and you will be judged, therefore you should be a good religious person. Heavy stuff, huh? 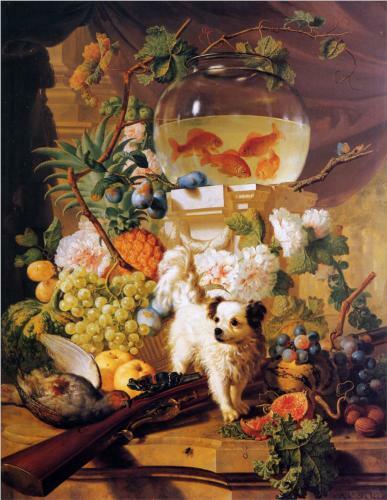 During the 18th century, the French aristocracy employed artists to create still life paintings of their bounty. The Rococo age was very lavish and decadent—the still life painting became a sort of bragging rights for what you could afford to eat and drink. The religious overtones of the Dutch paintings a century before were tossed out the window in favor of decadence. The 19th century turned the tradition of painting on its head and painters like Van Gogh and Manet challenged tradition in favor of invention. 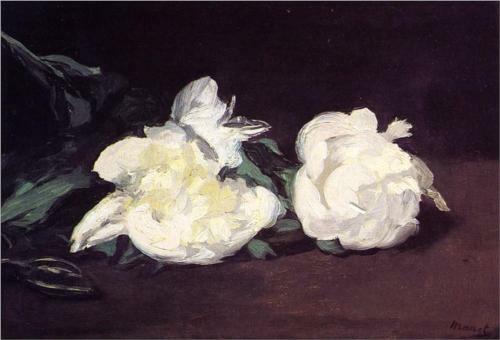 With Impressionist still life, allegory and symbolism are gone, as is detailed, fine brushwork. The artists became interested in the nature of the paint itself rather than the subject they were painting. 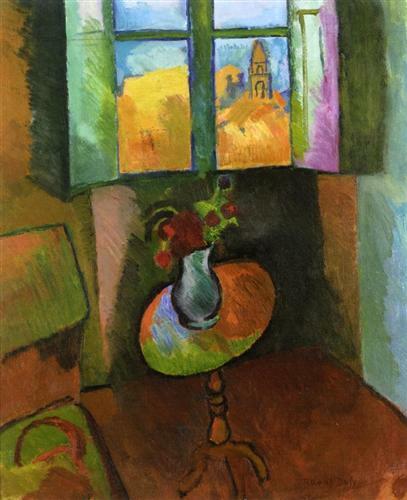 Impressionists and expressionists especially were more interested in the introspective/subjective experience. 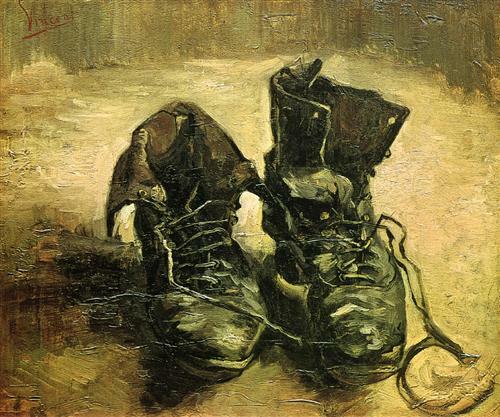 For instance, Van Gogh looked at the world with personal anguish and psychological turmoil and meant to express this visually, even in every day objects and still life paintings. The Impressionists also were trying to create a personal representation of an experience in a particular place—leaving an emotional/visual impression for others to connect to. This provides a more interesting and substantial comparison to the religious morality of the Dutch painters and the lavish stuff-driven still life culture of Rococo. 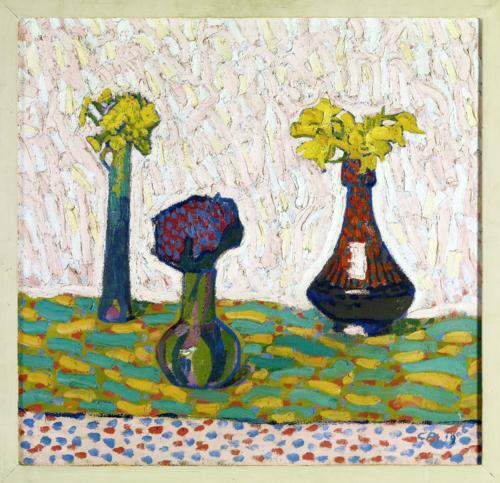 The 20th century ushered in even more experimentation and in 100 years, the art world was given a huge range of styles, from Post-Impressionism to Modernism, Cubism, Surrealism, Fauvism, Expressionism, and many more. 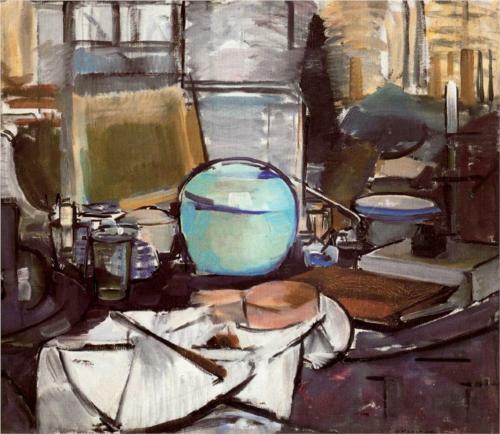 Think about the things that are interesting to you and set up a still life for yourself. Think about the overall composition and consider every aspect before you start—where is your light source coming from? Do you want to incorporate drapery somewhere, either on the wall behind your setup or on the table under the still life? How do the cast shadows from your objects interact with each other/other objects? Think about creating unity in your composition by using objects of varying sizes and shapes (see Composition for Beginners if you need a refresher). 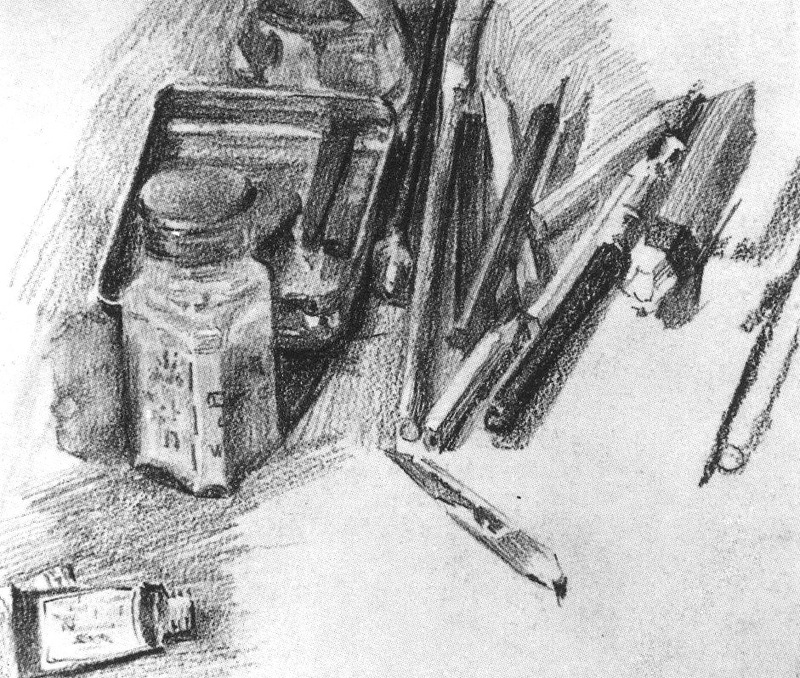 You can use either your graphite pencils or your compressed charcoal for this drawing—whichever you are most comfortable with. If you use charcoal, you may want to use your white charcoal pencil at the very end to make your highlights very bright (make sure you leave the paper blank where your highlights are—the white charcoal can only do so much!). The white charcoal pencil has a different consistency than graphite pencils, so they don’t mix very well together. For bright highlights while using graphite, leave the paper blank and use your kneadable eraser to lift graphite off certain areas. The video has been sped up so you can see the whole process quickly. Notice how the artist is first laying out very general, blocky shapes, then eventually refining them more as they go. Depending on your style, medium, size of drawing, and how complicated your set up is, your still life may take you a while to complete. Take your time! There’s no need to rush. You may expect to work 4-5 hours per week for several weeks on it. If that’s the case, make sure your still life can still be around while you draw it. If you have a space where you can leave it set up, that is ideal. If you have to take it down, make sure to photograph it so you can use the photograph for reference when you need to set it up again—don’t draw from the photograph! Make sure to note your light source so it remains consistent for each drawing session. If you plan to work slowly over several weeks, don’t use anything that will rot. Trust me on this one. Remember as you’re drawing that this isn’t about perfection or photorealism. It’s about you and your style. That’s not a permission slip to not try your best—still do as well as you can so that at the end, you have a drawing you are really and truly proud of—not because it’s perfect, but because you gave it your all. Once you’ve finished your drawing, show it to us! We would love to see what you’ve learned so far! Send a photo of your work using our submission form.